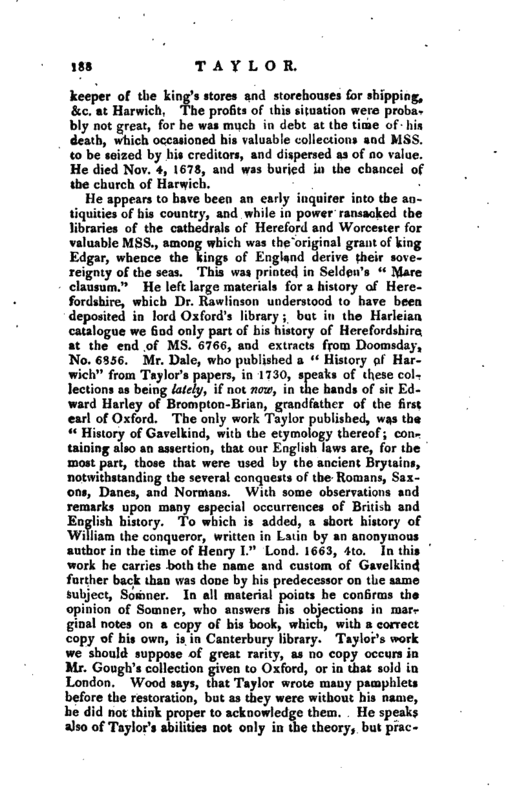 , an able English antiquary, who is introduced by Anthony Wood with an alias Domville or D'Omville, we know not why, was the son of Syivanus Taylor, one of the commissioners for ejecting those of the clergy, who were called “scandalous and insufficient ministers,” and one of the pretended high court of justice for the trial of Charles I. Silas was born at Harley near Muchweniock in Shropshire, July 16, 1624, and after some education at Shrewsbury and Westminster-schools, became a commoner of New-Inn-hall, Oxford, in 1641. He had given proof of talents fit to compose a distinguished scholar, both in the classics and mathematics, when his father took him from the university, and made him join the parliamentary army, in which he bore a captain’s commission. 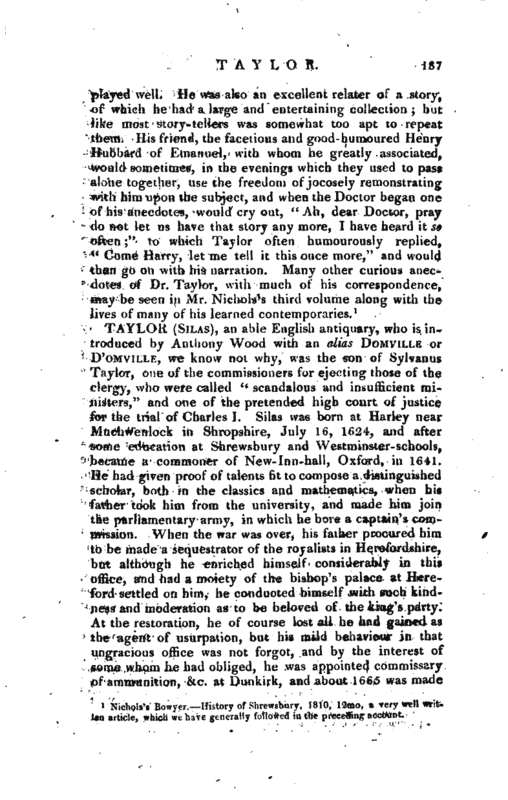 When the war was over, his father procured him to be made a sequestrator of the royalists in Herefordshire, but although he enriched himself considerably in this office, and had a moiety of the bishop’s palace at Hereford settled on him, he conducted himself with such kindness and moderation as to be beloved of the king’s party. At the restoration, he of course lost all he had gained as the agent of usurpation, but his mild behaviour in that ungracious office was not forgot, and by the interest of some whom he had obliged, he was appointed commissary of ammunition, &c. at Dunkirk, and about 1665 was made | keeper of the king’s stores and storehouses for shipping, &c. at Harwich. The profits of this situation were probably not great, for he was much in debt at the time of his death, which occasioned his valuable collections and Mss. to be seized by his creditors, and dispersed as of no value. 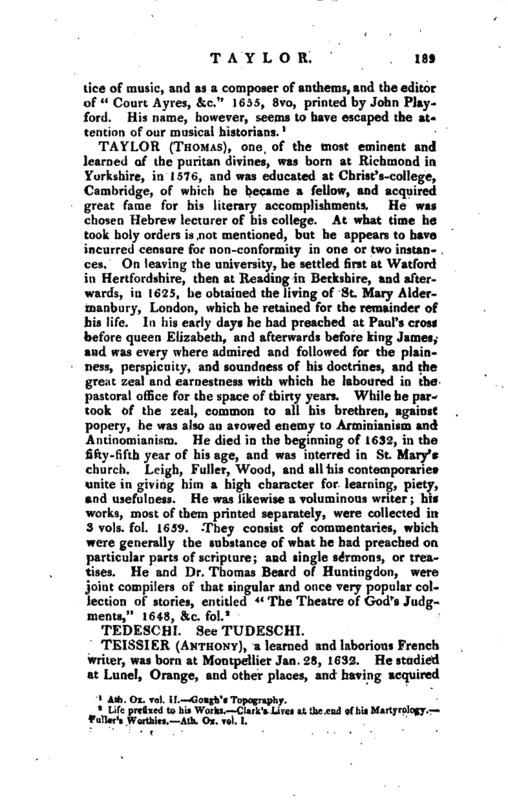 He died Nov. 4, 1678, and was buried in the chancel of the church of Harwich. Ath. Ox. vol. II.—Gough’s Topography.